Pine Hill Zendo Inc. v. Town of Bedford Zoning Board of Appeals. The Becket Fund for Religious Liberty (n.d.). Retrieved from https://www.becketlaw.org/case/pine-hill-zendo-inc-v-town-bedford-zoning-board-appeals/. Pine Hill Zendo Inc. v. Town of Bedford Zoning Board of Appeals. (Apr. 04, 2019). https://www.becketlaw.org/case/pine-hill-zendo-inc-v-town-bedford-zoning-board-appeals/. "Pine Hill Zendo Inc. v. Town of Bedford Zoning Board of Appeals." The Becket Fund for Religious Liberty. Accessed [Apr. 04, 2019]. https://www.becketlaw.org/case/pine-hill-zendo-inc-v-town-bedford-zoning-board-appeals/. Few cases better illustrate the arbitrary and even whimsical way in which local zoning boards often reject petitions for special use permits than the case of Pine Hill Zendo v. the Town of Bedford, New York. Pine Hill Zendo is a Buddhist temple, albeit a very small one. It is one of a handful of Rinzai Zen Buddhist temples in North America with a resident teacher, and consists of a meditation room in the home of John and Angela Mortensen. For a few hours four days a week, the zendo’s eleven members gather at the house for silent meditation, brief liturgies and instruction. In the spring of 2001, however, a neighbor complained to the Town Planning Board, and the Mortensens were asked to apply for a special use permit that would allow them to use the home as a “church or other place of worship,” although neither of those terms is defined anywhere in the Town zoning ordinance. The Zoning Board of Appeals held a hearing on the application on September 5, 2001, and a group of neighbors appeared in opposition. 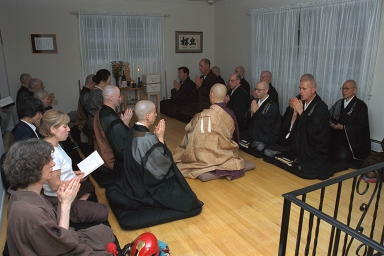 None claimed that they had been harmed or even inconvenienced by Pine Hill Zendo during the previous two years. One resident even testified that other neighbors told her they had never seen or heard anything, and didn’t even realize the Zendo existed. Opponents simply speculated that traffic and parking problems might develop. The ZBA rejected the application for a special use permit, citing “issues related to traffic and on-street parking,” although on-street parking is permitted in the area at any time except for overnight hours during the winter months. And, incongruously, the Board cited concern over noise, despite the fact that the Zendo’s primary activity is silent meditation. On November 2, 2001, Becket joined the case. On November 6, 2001, Pine Hill Zendo filed suit against the Bedford ZBA in the Supreme Court for the County of Westchester, New York, seeking reversal of the Board’s decision. The Town of Bedford subsequently settled, resulting in a victory for the Zendo.